Nineteen people have been injured, four of whom are in critical condition after an explosion caused a fire over four buildings in Manhattan’s East Village. Two of the buildings have collapsed, and another is still on fire and in danger of collapsing. The Fire Department now says that among the injured are four firefighters, according to the New York Times, though their injuries are not life-threatening. “Our thoughts and our prayers are with every one of [the injured people] and their families, and we pray that there are no fatalities,"Mayor Bill de Blasio told reporters earlier in the day. 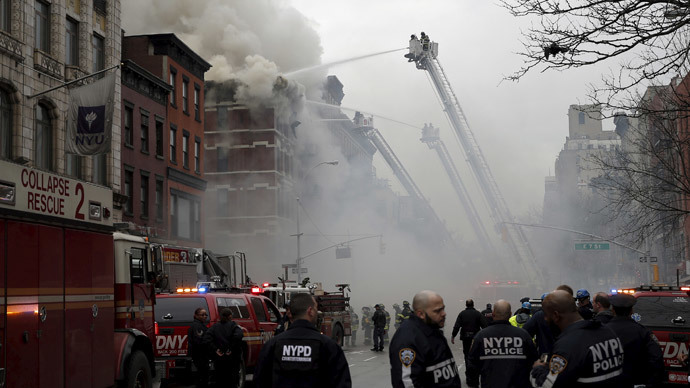 The preliminary investigation shows that the explosion was caused by a gas leak at 121 Second Avenue, where plumbing and gas work were occurring inside the building, de Blasio said. "I was going to have sushi at that place, and then I decided to get ramen, so it's only like three doors down [from 121]," a witness named Alexandria told WABC. "And then all the sudden, the whole building shook, and it looked like the glass was like rubber as it shook, and it pushed me forward. And I ran out, and I saw people climbing out of the building. I saw one woman bleeding profusely, and she was out of it and didn't know where she was going." Fire crews have contained the flames, but are still fighting the fire at 119 Second Avenue, which is in danger of collapsing. “There was a loud explosion that shook the whole block, windows shook and when we walked out to look and investigate the whole building on Second Avenue and Seventh was blown out,” Brandon Boudwin, who works at nearby Anthony Aiden Opticians, told 1010 WINS. The majority of people injured were hurt at the time of the explosion, New York Fire Department (FDNY) Commissioner Daniel Nigro said. The critically injured include two people with burns to their airways, and another person who became unconscious after the event. The explosion occurred around 3:15 p.m. ET, and the fire quickly spread to the buildings at 119, 123 and 125 Second Avenue. The FDNY upgraded the emergency from a two-alarm to a seven-alarm call within half an hour. A seven-alarm emergency means that about 250 firefighters were at the location from about 50 fire department units. The majority of people self-evacuated after the explosion, he added. The Thursday explosion happened just over a year after a gas leak caused an explosion and building collapse that killed eight people in Manhattan’s Harlem neighborhood. “We will be here for a very long night, and will keep our members and the public out of the collapse zone,” Nigro said. Con Edison, the gas utility for the city, had employees in the building an hour before the explosion, as a private company was upgrading 121’s initial gas service to a larger service, ConEd President Craig Ivey told reporters. “Gas was introduced to the head of service just inside the building’s walls, but was locked there,” he added. City officials stressed that the investigation into the cause of the gas leak is in its preliminary stages, and were not willing to speculate as to how it happened. The address where the explosion occurred, 121, was referred to as the "mayor's residence" in a New York Times article dated 1855. The building itself dates to around 1886, Newsweek reported, but a Landmarks Preservation Commission report says it’s possible that some sections of the building may have existed earlier on the lot. Another New York Times article, from 1930, says the address was the site of the Russian Art Restaurant, a speakeasy. There is a debris task force in place, and they are trying to get rid of the debris as quickly as possible, Office of Emergency Management Commissioner Joe Esposito said. Public School 63 has been set up as a Red Cross site to support residents and neighbors affected by the fire.